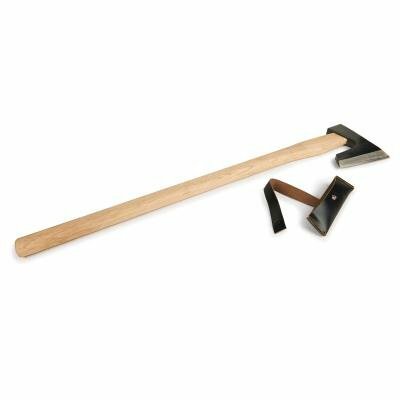 Since earliest recorded history, Japanese Carpenter's Axes have been used by carpenters for the traditional construction of temples and other buildings. The unique shape allows the hand to hold the handle directly above the blade for delicate cutting work. Mr. Tsuguo Abe is the last of a long line of blacksmiths specializing in hatchets and axes since before the 1830's. He hand forges each axe with a combination of high carbon and low carbon steels. His forging technique creates a long lasting edge that is easy to resharpen. The axe head weighs 26.5 ounces and overall weight is 2.85 lbs. The length of the cutting edge is 5? and handle length is 27 733;. They feature the same attention to detail and high quality as our world famous Swiss made carving tools. All tools feature "through eye" forging and come handled with unfinished solid ash handles. If you have any questions about this product by Table Top King, contact us by completing and submitting the form below. If you are looking for a specif part number, please include it with your message.